MINNEAPOLIS (AP) Michael Fulmer is a bit confused. ”I come here today just not feeling well. The ball felt heavy,” he said Wednesday. Niko Goodrum ended an 0-for-14 skid with a home run. He got into too many deep counts but was able to use a dominating fastball and a slider with better break to keep hitters off balance. ”We wanted him to get us to the sixth inning and try to get us through the sixth inning because we thought we could do a 7-8-9 with the `pen,” manager Ron Gardenhire said. Kyle Gibson (1-3) gave up three runs and six hits in six innings. He is 0-3 in nine starts since winning at Baltimore on March 31. Martinez hit a sacrifice fly in the first, but Eddie Rosario had an RBI single in the bottom half, the first of his three hits. Goodrum homered for a 3-1 lead in the fourth following a single by Martinez. Brian Dozier led off the bottom of the first with a drive to deep center that missed a home run by a few inches. The ball stuck in a seam between two pads near the top of the 8-foot wall in center, and Dozier was given a double. Called up from Triple-A May 12, Coleman has appeared in five games without allowing a run in seven innings, allowing three hits and striking out five. ”He’s stepping up in big moments. We thought we had some other guys that would fit that role and maybe he can bridge the gap. 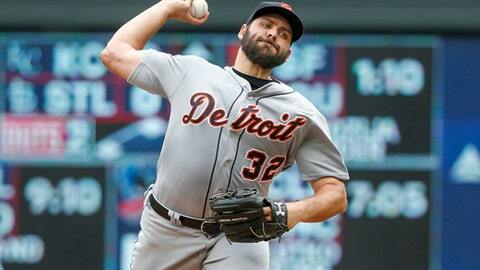 If he can do that, fantastic,” Gardenhire said. Castellanos had his fourth straight multi-hit game and was 6 for 12 in the three-game series. He is hitting .324 and has 19 multi-hit games. Tigers: LHP Matthew Boyd, who left Tuesday’s game with a left oblique spasm, was feeling good and expected to get out and move around pregame, Gardenhire said. Twins: Molitor said 3B Miguel Sano (left hamstring strain) was to play first base for Triple-A Rochester on Wednesday before potentially returning to the Twins. … RHP Michael Pineda is to throw 15 pitches off a mound for the first time Wednesday since having Tommy John surgery last July 18. Tigers: RHP Mike Fiers (4-3, 4.57) is to start Friday against the Chicago White Sox in the opener of a season-long 12-game homestand. Twins: RHP Fernando Romero (2-0, 1.66) is on the mound Friday at Seattle to start a six-game trip.